Coconut oil is all these rage these days. It has literally become the go-to treatment for most anything. This is because it truly is powerful stuff. It is an all-natural healer that is affordable and readily available, so why not take advantage of its magic? Coconut oil is the most nourishing oil you can put onto your child’s skin. The small molecular structure of coconut oil allows for easy absorption through the skin and into the cell structure of the connective tissues. This means that it has the ability to actually restore damaged or diseased skin. Coconut oil will also have lasting benefits, unlike most lotions and creams designed to “heal” external issues. While there are some pretty obvious ways in which infants and children can benefit from coconut oil, there are also a few others you may have overlooked. 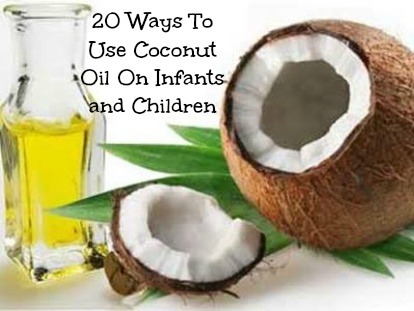 Below are 20 ways that you can use coconut oil on infants and children. Baby Acne – apply a thin layer onto areas affected with baby acne twice daily until gone. Read more about how coconut oil works for acne. Soft Spot Strengthener –rub coconut oil on the baby’s soft spot to help fortify the area. Sunscreen – coconut oil alone can offer some degree of sun protection however, it works even better when used in conjunction with other oils that contain natural SPF. If you are interested in learning more about the powers of coconut oil, please check out 333 Uses For Coconut Oil. Do you use coconut oil on your children? How has it helped? Share here! I have to advise you that statements in this post have not been evaluated by the Food and Drug Administration. 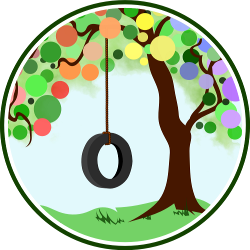 Products and/or information are not intended to diagnose, cure, treat, or prevent any disease. Readers are advised to do their own research and make decisions in partnership with your health care provider. Nothing you read here should be relied upon to determine dietary changes, a medical diagnosis, or courses of treatment. I have A son that is 39 days old And I put coconut oil in his hair…How long can I leave it on there before I wash it out? Also can I put it on his face…and how many times per week do I put it on? I have used coconut for so many things. I used it on my baby’s cradle cap, as a diaper rash treatment and as a sun screen. I keep some coconut oil in every room. 😉 Also both my kids love mashed potato with coconut oil instead of butter. My four months got excema and the skin is too dry help me how can I get rid of dry skin .I have tried epimaxerox and aura cream bt it’s not working at all.